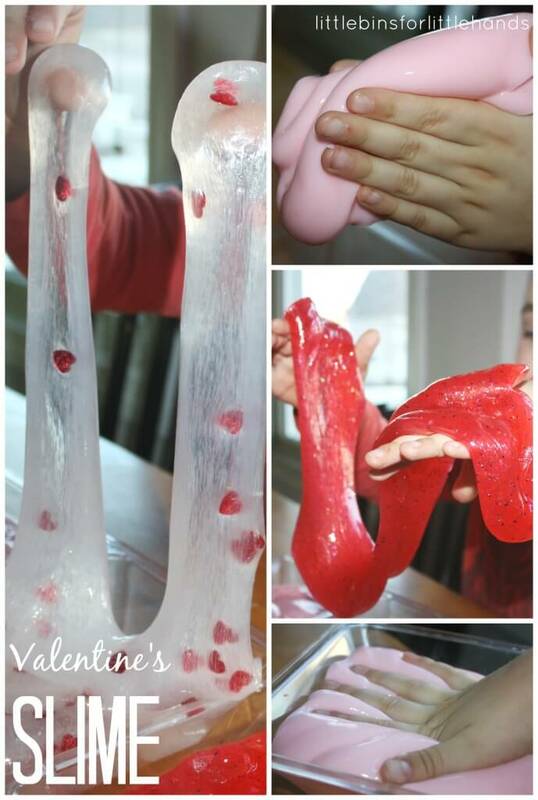 Simple Valentines Items Make for Simple Sensory Play! I do love Valentines Day! All the red and pink and hearts and oh yeah, the love too! 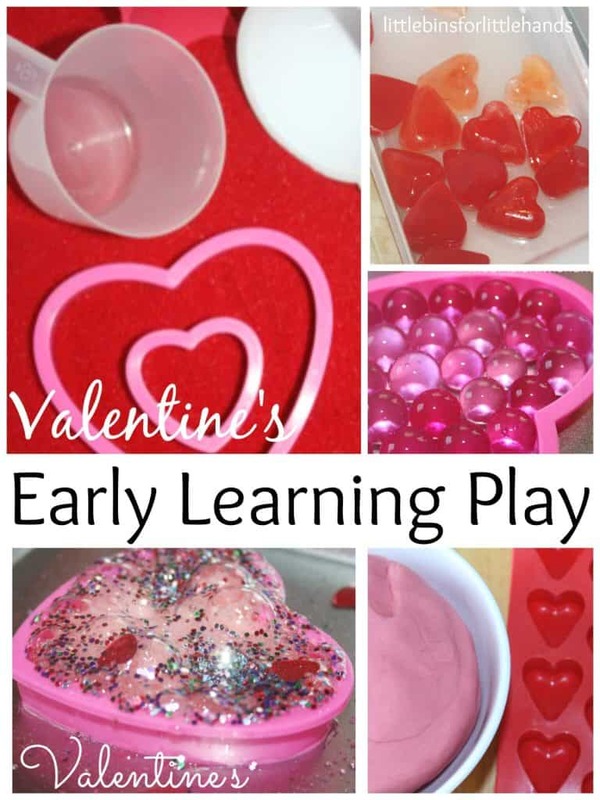 We have done a lot of Valentines sensory play and learning this month, but still have a few more surprises left. I also like to find new ways to use the supplies I have already purchased. This winter hearts sensory bin is a simple, sweet invitation to play. 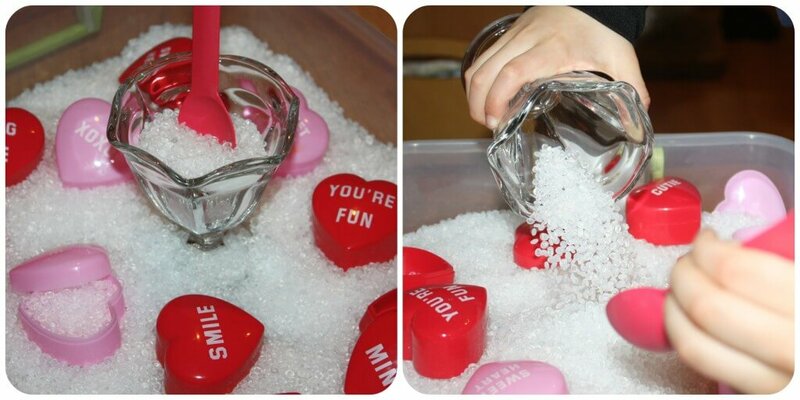 This hearts sensory bin is one of our awesome Valentine’s sensory bin fillers list! 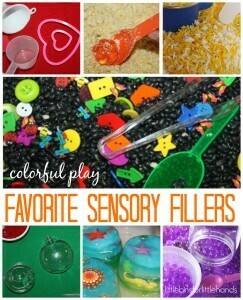 Lately, I have noticed that the less I put in a sensory bin the better, and this hearts sensory bin is no exception. 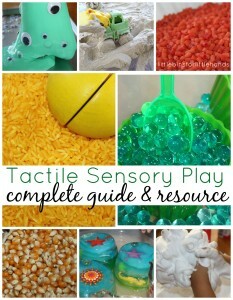 Why are sensory bins important, check out our sensory play resource guide! 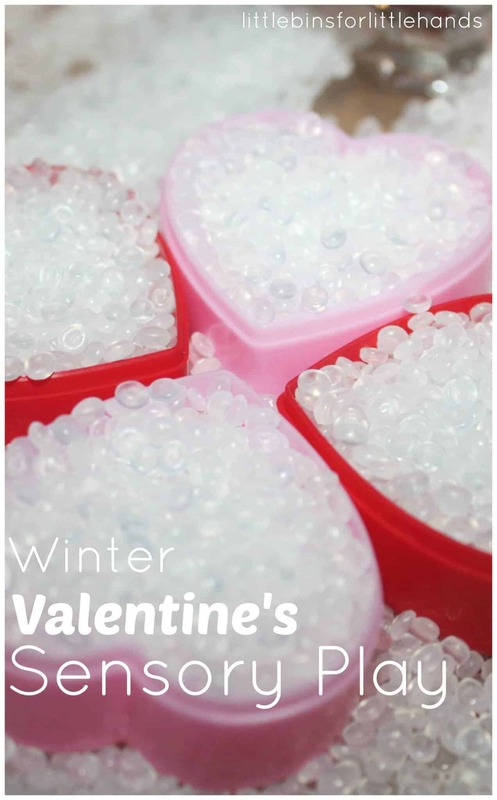 My original hearts sensory bin includes poly fill beads (craft store filler for beanie animals) that look like wintery fun! To the filler I added these fun heart shaped containers also purchased from craft store, an old fashioned ice cream dish and a fun spoon (recent trip to yogurt shop). Very simple! I thought about the buttons and sequins and such that I also had, but decided to leave the hearts sensory bin simple and clean! Love is just that, simple! He really enjoyed the texture and feel of the beads. More and more I am realizing he is more drawn to certain textures more than others even if they are not messy He loved filling the hearts and shaking the containers. He exclaimed that he was making maracas! He scooped the beads into the dish to make sundaes for us. This is when he wanted a straw for us to each drink our creations! When he was done drinking, he noticed he could fill the straw with the poly beads. What great fine motor skill work too without even thinking about it! 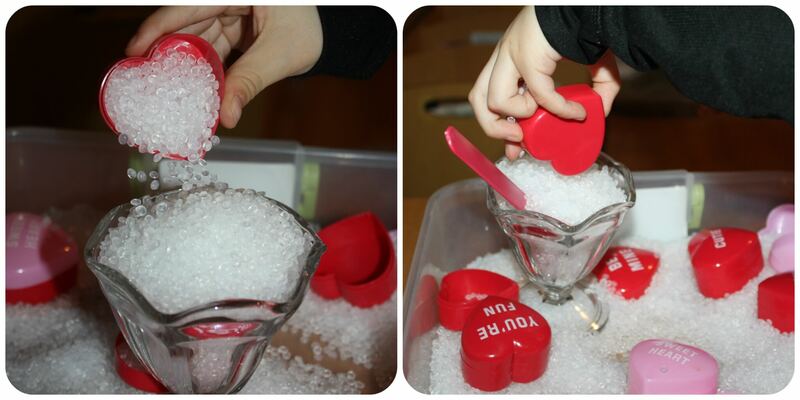 Dumping in the hearts sensory bin! 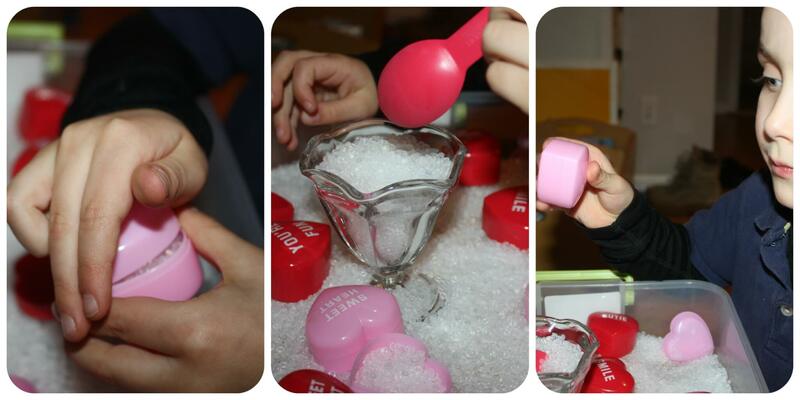 Filling in the hearts sensory bin! Making Music in the hearts sensory bin! 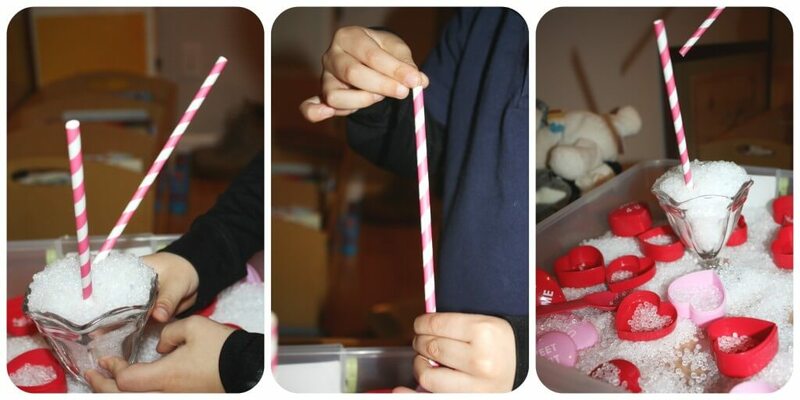 Playing with Straws in the hearts sensory bin! 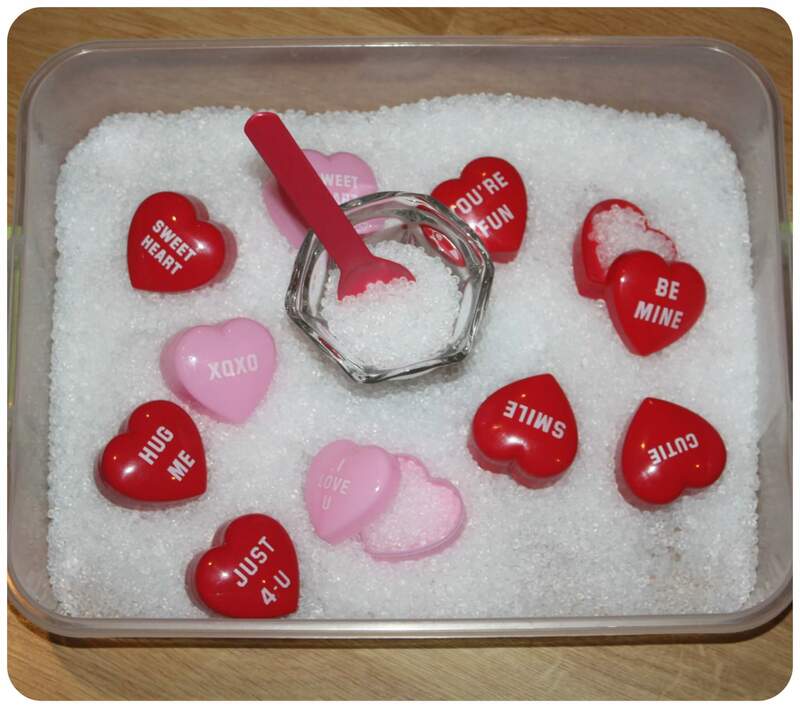 Have you made a hearts sensory bin for Valentines Day Yet? 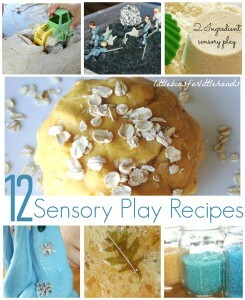 Other fun sensory play ideas!